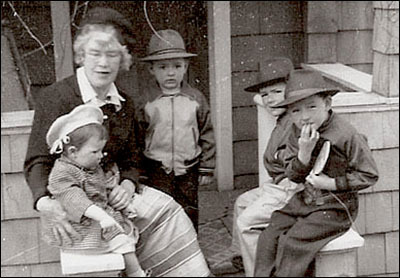 Elizabeth (Liz) Major was one of ten children of William James Major and Mary Ann O'Neill, a couple who emigrated to the United States from Ireland shortly after they were married in 1865. They settled in Skaneateles Falls, New York. Liz was the self-appointed family historian. She was proud to be the daughter of an O'Neil and loved to tell the story behind the O'Neil family crest and the Legend of the Red Hand. Liz kept in touch with other family members into her 80s, sending long, rambling letters that covered current events, reminiscences of childhood events, stories about family members who'd recently married, given birth or died, plus comments about popular culture. Liz kept up with everything. She also loved expressing herself in verse. Her exchanges with my father, Buster Major, were like two poets playing Can You Top This? A poetry slam before its time. For several years Liz and her sister Sadie, better known as Sate, shared a home in Skaneateles Falls. They were entertainingly eccentric and would have been at home performing "Arsenic and Old Lace." MY FAVORITE Liz recollection is an incident from the years after Sate's death. True story, though the quote may not be exactly correct. By then Liz was living by herself. She was alone in her backyard one day when she noticed a young man strolling toward her house. Suspicious, Liz went after the man and shooed him off her property, realizing too late he had been there to read her electric meter. Recovering quickly, Liz went into her house and called Niagara-Mohawk Power Company. "I want to apologize for something that happened a few minutes ago," she said. "One of my cousins is visiting; she's old and a bit crazy. A nice young man stopped at my house to read the meter, but before I could stop her, my cousin chased him away." Among the papers left to me by my mother was an undated article from The Catholic Sun, the official newspaper of the Syracuse Diocese. The article chronicled the Irish influence in Skaneateles, New York, and was largely based on the experience of William James Major and his wife, Mary O'Neil. The article stated that, at Easter, William Major told his children a special story, "The Easter House," about a little house Irish children made during Holy Week. By looking through it, William Major said, "one could see the sun dance on Easter morning in honor of the Resurrection." Like he made in Ireland when a lad. Not a dancing ray we found. And the dancing of the sun. Here's a link to the video I just posted, which is clips of Aunt Lizzy from my Dad's home movies. The last clip is me standing next to Lizzy next to her front porch; it was taken in July of 1970. She died the following June. Also in the video are brief glimpses of my parents, Buster and Helen Major, and of Maggie Major Nicholson and a granddaughter, Karen Mullally. Thanks for the memories, Rob. Also from Rob Major, this photo of Liz Major with children of her nephew, Bud Major. I'm guessing the youngsters are Marie, left, Patrick William Major, John T. "Jack" Major and James Timothy "Tim" Major, but I'm unsure which boy is which.